Some of you were wondering why I had a 若葉マーク (new driver magnet) on the back of my XTerra (and previously, on the back of my Civic). As it happens, it's not just a joke. 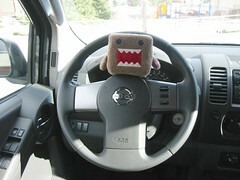 Here's the real reason -- Domo-kun likes to drive, too! Don't worry, if he gets pulled over, he can hide in the glove compartment.